The 2018 Borobudur Symphony - Mariah Carey Live in Concert will be held in Lumbini Park, Borobudur Temple, tonight, November 6. Mariah Carey will perform in a full big band consisted of 51 people. She is scheduled to perform for more than 1 hour 30 minutes. "Mariah Carey's performance duration is one and a half hours. It could be more because there is something interesting when Mariah Carey's team find out about the Borobudur Temple. There will be a very interesting improvisation on the stage," said Rajawali Indonesia Communication CEO Anas Syahrul Alimi as the 2018 Borobudur Symphony event consultant at Hotel Tentrem, Yogyakarta, Monday, November 5. Anas mentioned that technical and non-technical preparation had reached 100 percent, including the sound system, lighting, and the stage measuring 18x20 meters, which will surprise the audience. The audience from the festival class to super VVIP can enjoy the stage with the view of the temple landscape. 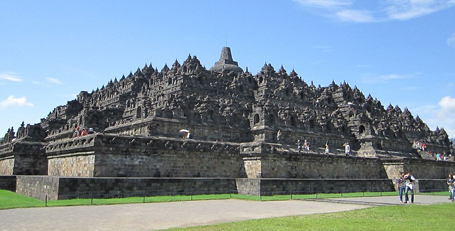 "So that the audience can fully see the Borobudur Temple," Anas said. Bakkar Wibowo, Creative Director of 2018 Borobudur Symphony, said that the stage had been set up in such a way as to international concert standards. The top of the stage is opened and the back of the stage has full of view of the temple with good lights. "Mariah Carey is very excited to perform," Bakkar said.